When I was asked to bake a cake for a rather sad occasion last week, I thought I’d try out one of Will Torrent’s recipes, or two of them in fact. I adapted his Nans’ chocolate fudge cake recipe to make it into a three layered cake, then topped it with a chocolate glaze from his recipe for salted caramel &amp; rum top hat cake. I used my usual mix of half wholemeal and half white flour, substituted coffee for the vanilla and milk and used dark muscovado sugar rather than light. I didn’t get to try the finished item, but with three layers of cake, three layers of buttercream icing and chocolate glaze, it looked to be a good one. Strangely, I did get to try the icing and glaze – *innocent face* – so I do know they passed muster. I am of course entering this into We Should Cocoa which is being hosted by Sarah over at Maison Cupcake this month. She’s on a bit of a layer cake mission at the moment, she’s made at least four this month. With four large eggs in the mix, this has to go to Dom’s new challenge Simply Eggcellent over at Belleau Kitchen. This also goes to Ness over at JibberJabberUK for Love Cake as this fits nicely into the theme of It’s in the Book. My recipes came from Chocolate at Home by Will Torrent. And I haven’t entered Cook Blog Share for a while, so this is being sent in Lucy’s direction over at SuperGolden Bakes. A sumptuous three layer chocolate cake, filled with chocolate buttercream and topped off with a rich chocolate glaze. Cream the butter and sugars together for a good few minutes until pale and fluffy. Beat in the cocoa until well combined. Beat in the eggs one by one, adding a little flour if the mixture looks like curdling. Sieve in the flour and fold in alternately with the coffee until just combined. Divide between three 20 cm (8") cake pans (you will need to grease and line these if not silicone). Bake at 180℃ for 25 minutes. Leave in the pans to cool for ten minutes or so, then turn out onto a wire rack to cool completely. Melt the chocolate in a bowl sitting over a pan of hot water - make sure the pan doesn't touch the water. Allow to cool slightly. Cream the butter and icing sugar together until light and fluffy, then beat in the syrup and cocoa. Beat in the coffee, followed by the chocolate. Place all of the ingredients into a small pan and set over a low heat until the chocolate has melted. Stir until smooth and allow to cool a little. Spread the buttercream equally on the three cakes, then stack them one on top of the other. Pour the glaze over the top layer of buttercream. Spread it to cover the top, allowing some to drizzle down the sides. Decorate as wished or leave plain. I’m sorry you didn’t get to try it yourself due to the sad occasion. It looks delicious so I hope you get the chance to try it another time. Thanks for linking up. sorry to hear about the sad occasion too. It does look very tasty indeed and I believe Will Torrent is a master of chocolate recipes so a good book to refer to! 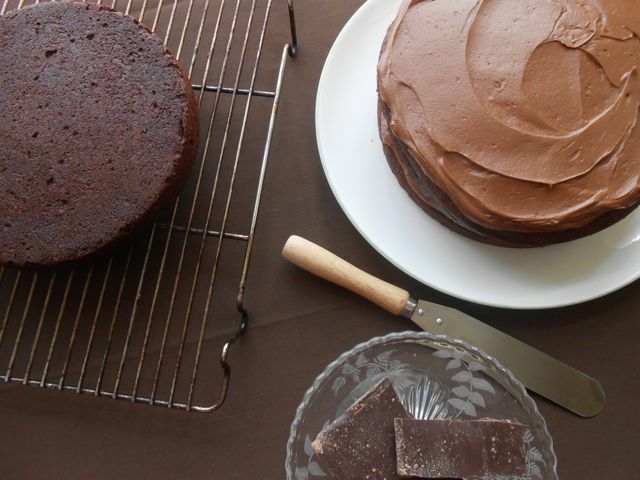 I need to experiment with chocolate fudge cakes, I don’t think I’ve ever made a proper one! I am sure the recipients appreciated your cake very much. Thanks for making it a layer one to submit to We Should Cocoa! Never made a chocolate fudge cake Sarah? Well there is still time to get another layer cake made this month 😉 Thank YOU for hosting this time around. Yummy! I hadn’t heard of Will but I’m off to follow him on Instagram now! Comes with a warning Kerry – you will want chocolate! Absolutely Gina, it gives a nice fudgy quality too. Thanks for commenting. The cake looks amazing and so chocolicious.I would love a slice or two. Thanks Nayna, there’s no doubt about it, it’s going to have to be made again! There is never a ‘wrong’ time for chocolate cake – this one looks divine! Looks like a mighty fine chocolate cake. I like the sound of dark muscovado sugar in the sponge and golden syrup in the icing. May have to try this recipe when I have my next urge for chocolate cake. P.S. Your new website is looking very swish! Thanks Jo. I’m glad you like my new site. There’s still plenty of work to do on it, but it’s getting there. As for the cake, I didn’t get to try it, but the feedback was good. I haven’t been eating your comments, promise Dom. There is something rather glorious about three layered cakes and this is only the 2nd one I’ve ever made – shocking really. All sad occasions should have a cake like this to make them feel a tiny bit better! It looks like you did the request proud…… A stupendous example of how a chocolate cake should be! That looks a very serious, very delicious, very inviting chocolate cake. Very, very special. I love the new look site, by the way, and I apologise for not saying so sooner. Haha Phil, a serious chocolate cake indeed. So glad you found the new site (and like it), it was a all a bit of a rush before I moved and I didn’t have a chance to let people know.